Lloyd and I are in Scotland for a romantic weekend so obviously we’ve just watched the Bodyguard in bed and I’m now on my computer while he reads me tweets out about the Bodyguard as we try to decipher the plot. Sexyyyyyyy. HERE is a piece I wrote for today’s Style mag about women’s football. Was so chuffed to write it. In a nutshell, this is the first season that there’s been a fully-professional women’s league even though it’s 2018 and male footballers have been paid £921m a week for decades. That’s the patriarchy for you. You know how people say children are the new tyrants? That the balance of power has swung too much in their favour and we – the adults – are now slaves to the small dictators and pander to their every whim? I’m going to suggest the same thing has happened with restaurants. I don’t know if you’ve tried to book a table at a restaurant recently but it can be a life-shortening experience, as frustrating as trying to get a doctor’s appointment. As if they’re deigning to have us eat in their restaurant, instead of vice versa. 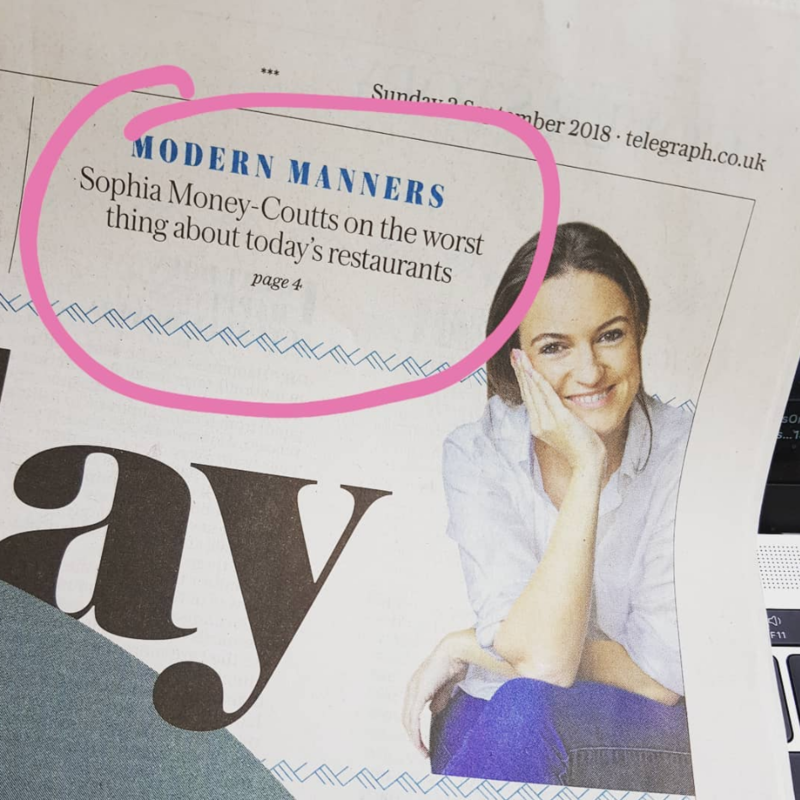 Which is why I’m thrilled that food critic Jay Rayner has recently slammed the 90-minute rule in particular, causing a furious Twitter debate on the matter and plenty of restaurant criticism. Good! Let there be criticism! Let’s end this restaurant stronghold over us! In recent years we’ve all become desperately silly about eating out – about booking tables at the latest opening so we can boast at having eating there and Instagram three feeble pieces of handmade ravioli. We’ve become slaves to the restaurant scene, causing a shift in power from us to them. I went to a restaurant the other day and ate a bit of octopus that was covered in flowers. Enough! I propose a ban on 90-minute table for a start. Such a nonsense – what if the service is rubbish? What if the waiter takes ages to come and take your drinks order when you arrive? What if the starters don’t come for so long you polish off the bread basket and are eyeing up your napkin? The only scenario in which a time-limit on a table is acceptable is if you’re eating with someone you don’t like – an awkward lunch with a colleague or a bad date. Or an ex. Or a family member who annoys you. Or someone with terrible breath. I also want to ban restaurants that don’t accept bookings at all and make you queue outside for half an hour as if a Victorian street urchin. I want to ban places that ask how you want your steak or burger to be cooked, only to be told that it ‘has’ to be medium or above. (why ask, in that case?) I want to ban communal tables and uncomfortable benches. I want to ban weird-flavoured butters and waiters who say ‘Can I tell you how the menu works?’ I want to ban ‘deconstructed’ puddings. Collectively, we need to become far less pretentious about restaurants. There’s nothing wrong with a dough ball at Pizza Express. Or a bowl of pasta from Spaghetti House. A former colleague at Tatler often took interview subjects there because he said the carbonara was excellent. Let’s take back control. The revolution starts now. It was an unlikely place for an epiphany. There I was on bank holiday weekend, standing in the boarding queue at Gatwick trying to disguise the fact I’d got two bits of hand baggage. I say a queue, it was more of a gaggle of people, waiting in a passive aggressive semi-circle around the desk. There was no discernible line; everyone was poised for the boarding announcement like Usain Bolt, despite being loaded with rucksacks, babies, water bottles, books and papers. Then came a shout; ‘speedy boarders only please’, and several smug-looking sorts – lots of panama wearers, I noted – elbowed their way to the front. The air of entitlement! The trampling of others underfoot! The clear disdain for those of us who’d refused to pay simply to get on the plane first! Forget going to Eton; speedy boarding is the new class system in this country. Shortly before this epiphany, I bought a copy of Vanity Fair – the book, not the magazine – from WH Smith. To my shame, I’ve never read it and, as a new ITV series is kicking off tonight, I feel it’s a wrong I need to put right. The same goes for Middlemarch. When either book has come up in conversation before (I go to some pretty wild parties), I’ve always felt a sense of disgrace at never having read them. I suspect many of you may harbour similar shame about certain classics you’ve never read. But unless you’re Will Self, who recently claimed that he sometimes has 50 books on the go, how is one supposed to read everything? So as wonderful and witty as Vanity Fair is thus far (I’m only on page 103, Thackeray seems terribly wordy?) let’s stop classic-shaming ourselves when we slither into bed with something sniffed at as ‘low-brow’.